send or fax to D'Alessio Innovations. We accept payment through paypal which accepts all major credit cards. Please send PayPal payments to Dalessio126@aol.co. if specific bead colors are out of stock. **Note decorative spacer designs might differ per availability. via email. Processing of your order begins once payment is received. All items are shipped USPS, Insured Priority Mail. Acharge of $5.95 will be applied for shipping. For orders over $50.00, shipping is FREE. Florida Residence will be charged 6% sales tax. If you have any further questions, please send inquiry to customer service. We at D'Alessio Innovations, know that you will love your purchase. the shipping date and we will refund your payment less shipping charges. 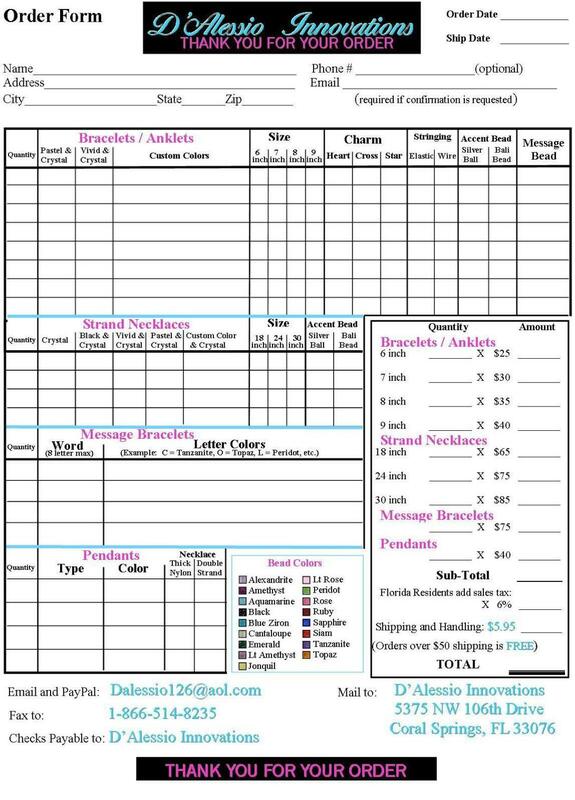 please print out our return form, and our order form,. Accurately fill out all relevant information on both forms. Insert both forms with the jewelry , in perfect condition, in original packaging. Mail it INSURED, to the address listed below. inform you with the status of when your new item will be shipped. 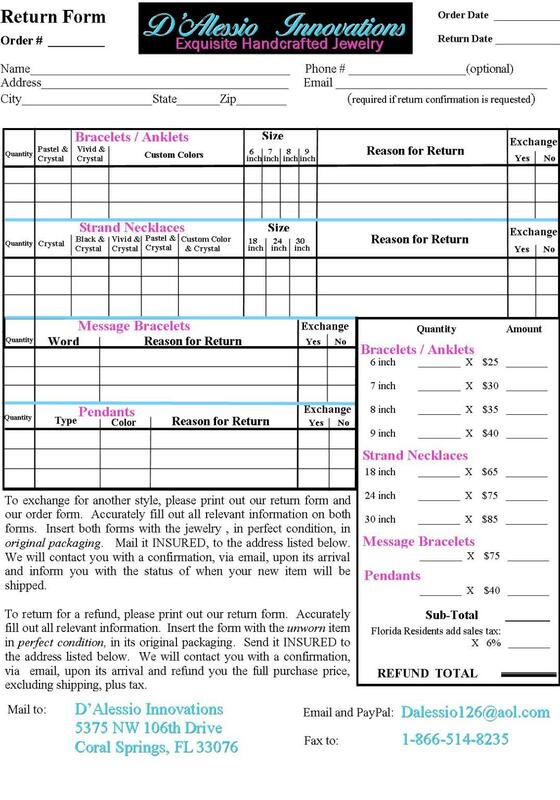 To return for a refund, please print out our return form,. Accurately fill out all relevant information. Insert the form with the unworn item in perfect condition, in its original packaging. Send it INSURED to the address listed below. D'Alessio Innovations, guarantees that we will not sell or share any of the information that you may provide us.